If you wanted to be fancy, you could use a round cookie cutter and make perfect little rounds of this traditional 'gevulde speculaas' with a dainty almond perched on top, but frankly, this is not fancy food. I prefer the easy and slightly more humble approach of just cutting it into messy slabs, to be slavered up with greedy abandon. Make the almond paste and set aside. In a separate bowl, mix together the rest of the ingredients and knead (you may use a mixer with a dough hook attachment for this). You should be able to shape the dough into a ball without it sticking to your hands. Cover the dough ball with plastic wrap and set aside for an hour. This allows the spices to work their magic. Preheat the oven to 347 Fahrenheit (175 Celsius). Line two cookie sheets with parchment paper. Halve the dough and press into an even, flat layer on the parchment paper of both cookie sheets. Spread an even layer of the almond paste on top of one of the layers. Now gently invert the other layer on top of the almond paste and peel away the parchment paper. Brush with egg white and sprinkle almonds on top. Bake for about 30-35 minutes, or until you can see that the almonds are caramelizing and the cookies are turning a slightly darker shade of brown. Allow to cool on a cooling rack for about 10 minutes and then slice into rectangles with a serrated knife. Now allow to cool further. Basterdsuiker is a typical Dutch product. It is manufactured by adding invert sugar and other ingredients to fine white refined sugar. This mixture helps to achieve certain textural structures and keeps baked goods moist. There are three varieties, white, brown and dark brown, called witte basterdsuiker, (licht) bruine basterdsuiker or gele basterdsuiker, and donkerbruine basterdsuiker. It is widely available from Dutch supermarkets and some Dutch groceries on the internet. I've had good results substituting the donkerbruine basterdsuiker in this recipe with pure cane sugar (demerera). Make your own (almond paste). You can also buy ready-made almond paste in most Dutch supermarkets or online. If using store-bought spijs, simply mix one egg through it before using. You can order little sachets of speculaas spices (known as speculaaskruiden) online. But you can easily substitute pumpkin pie spices. You can also make your own speculaaskruiden. To make round gevulde speculaas cookies, cut rounds out of the dough after you've flattened it. Place the first layer of rounds on a cookie sheet lined with parchment paper, making sure to leave some space in-between the cookies. 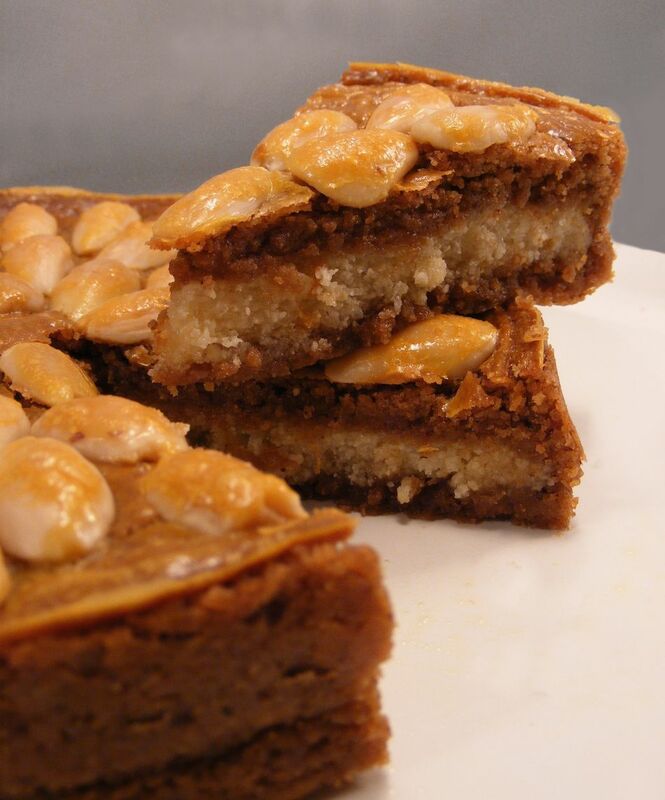 Place a tablespoon of the almond paste (amandelspijs) in the center of each cookie. Brush sides of cookie with egg white. Place the other round on top and press to seal. Brush the top of the cookie with egg white and place a whole blanched almond on top.